This elegant and sophisticated necklace has a focal "script stone" with rich caramel brown and black colors running through it and is embellished with sterling silver swirls and curls. 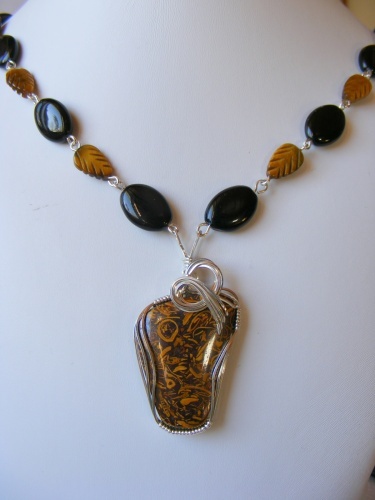 The necklace has sweet tiger eye leaves and also pretty onyx oval beads to match the stone and bring out the richness of the colors. Matching earrings are complimentary. Piece measures 18" in length.